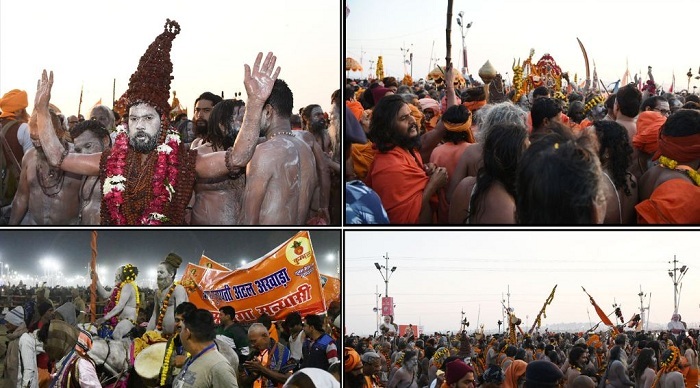 For the first time at Prayagraj Kumbh, about 800 saints were given Sanyas Diksha at Dashanami Juna Akhara. All religious ceremonies were completed this morning on the bank of river Ganga. The ceremony was initiated yesterday with the shaving of the head of saints and taking a holy dip in the River. Barbers were called from Haridwar and Varanasi for the purpose. Several rituals were performed at the camp of the Akhara and on the bank of the River including Diksha by Acharya Mahamandaleshwar of the Akhara Swami Awadeshanand Maharaj. Saints who were given Sanyas Diksha at the Kumbh include six from abroad. Their identity has not been disclosed by the Akhara saying Sanyasi has no relatives and they become Digambar following Sanyas Diksha. They leave their clothes and only bear coppery. All newly recruited Sanyasi will join the second Shahi Snan on Mauni Amavasya with saints and seers of Akhara. They have been given Sanyas Diksha after close monitoring of their behavior during three years in the Akhara. Akharas Saint Swami Vidyanand Saraswati and Secretary of Akharas Parishad Swami Hari Giri monitored the ceremonies of Diksha. The entire process of Sanyas Diksha will be finally completed after holy dip at Sangam during Shahi Sanan of Akhara on Mauni Amavasya. Juna Akhara is the first Akhara that has performed Sanyas Diksha to saints at Prayagraj Kumbh.